Let’s Go Purple Eagles! 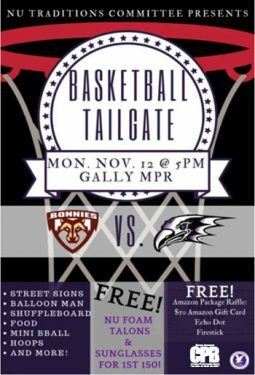 The NU community are invited to attend the Men’s Basketball Tailgate Party on Monday, November 12th starting at 5:00pm in the lower level of the Gallagher Center. FREE! There will be food, games, poster-making station, and more! At the same time there will be a Make-A-Monte station where you can purchase your own Monte stuffed plush for $20. Benefits go towards the Adopt-A-Family project run through Campus Ministry. Tickets are still available for the season-opening game vs. St. Bonaventure. Tipoff is set for 7:00pm. You can order tickets by visiting www.purpleeagles.com or by calling (716) 286-TIXX (8499). The tailgate is sponsored by the NU Traditions committee. Any questions please contact Bill Newton, Assistant Director of Campus Activities at wjn@niagara.edu.